May be orange and yellow if white is not available. Size: Approximately 18"H x 15"W.
The Sunny Days Ahead Asiatic Lily Bouquet blooms with a fresh exuberance to send your special recipient an amazing flower bouquet set to brighten their day! Featuring Asiatic Lilies in mixed shades, this flower arrangement boasts multiple blooms blossoming from each stem to give them a full and lush bouquet they are sure to love. This lily flower bouquet will be a wonderful way to help them celebrate a birthday, the arrival of the spring months ahead, as a way to extend your special message about life's notable moments. 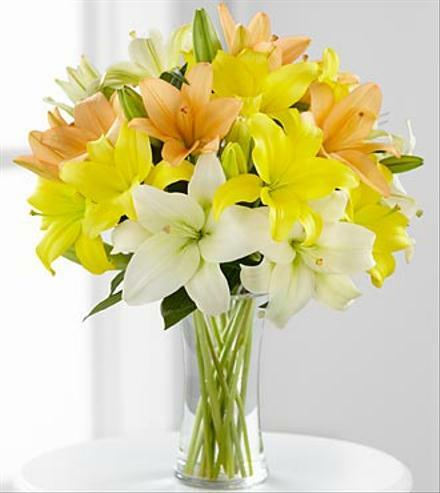 Celebrate Easter with the Sunny Days Ahead Asiatic Lily Bouquet. Florist Notes: Asiatic lilies have little to no fragrance.